I left home about noon on May 19th. I had several stops to make, including putting air in the tires of my trailer. I was headed for Chiefland on the west side of the state. The trip was about 220 miles long and would take about four hours. In Chiefland, I registered in at the Quality Inn at about 4:15, then headed for the state park. I wanted to see the park again and check out the launch area before tomorrow morning's training. Bruce and I had paddled into Manatee Springs State Park several years ago (click here to read that trip report). We had paddled a day trip, to end at Fanning Springs State Park. But when we got to Fanning, Bruce wanted to paddle some more, so we continued on for another nine miles or so to Manatee Springs. I thought I would recognize the areas of the park we visited, but I did not. I arrived at the park about 5 PM and drove to the kayak and canoe launch area. I walked from the parking lot to the spring, passed the launch area, and then walked down a boardwalk toward the Suwannee River. I was totally alone in this part of the park. Walking along the boardwalk in the shade of the surrounding bald cypress trees, above the shallow, clear spring water, I was startled by a loud splashing to one side near my feet. I caught a glimpse of a tan colored animal, about the size of a large dog. As the animal put some distance between us, it stopped and turned my way. It was a deer! It looked like the white tailed deer I'd seen up north, but it was tiny by comparison. We watched each other briefly. Then, the deer, sensing no danger, went back to foraging for its supper. 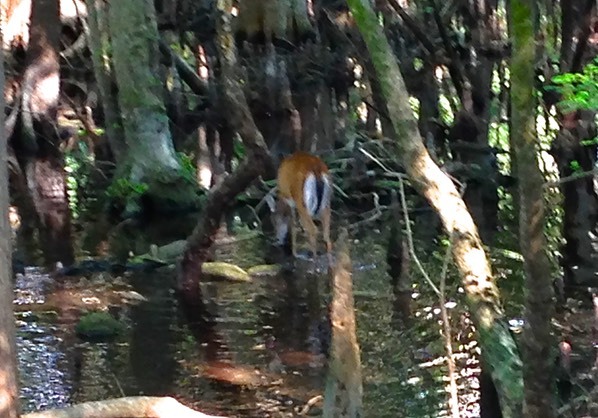 I watched for a while, then continued on down the boardwalk toward the fabled Suwannee River. At the end of the boardwalk was a gazebo, standing on pilings, above the Suwannee. There was a ramp descending to a floating dock, both attached to the gazebo. I do not remember this at all, yet I know this was the park we stopped at. I needed to explore some more. I headed back to the motel, determined to stop at the car parts place I saw earlier to get something to lubricate the god awful squeak coming from my trailer hitch. An application of silicone grease, and the squeak was gone! 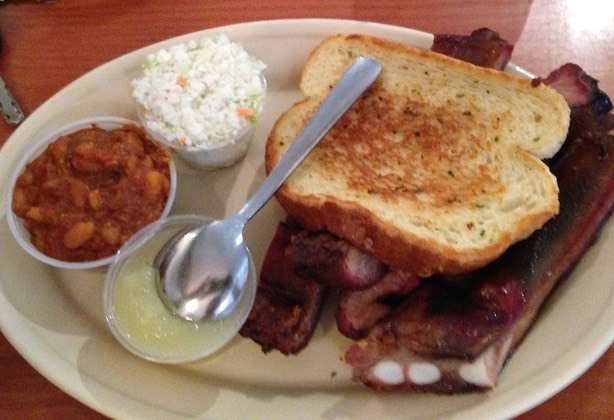 Next stop was Bar-B-Q Bill’s for a truly mediocre meal. Bill's was the only local restaurant I saw with cars in the lot. That's the reason I stopped there. And I passed up McDonald's for that! It turned out to be a local Redneck place. I use the term Redneck with love in my heart, because I’ve met some wonderful people in these more rural parts of Florida, and this place was no exception. But the ambiance of the place (early bunkhouse) and the cultural overtones (“What can I get for ya, Sweetie?”), combined with the type of food on the menu (baked beans, slaw, bottled apple sauce and all kinds of smoked meat), and the super sized physiques of ninety percent of the patrons all said “Redneck” to me. Next morning I had a quick motel breakfast and headed back to the park, stopping to pick up a Dunkin' Donuts coffee and my favorite Old Fashion donut on the way. Training was scheduled for 10:00 AM. I arrived at nine. I wanted to check out more of the park and see if I could solve the mystery of my previous visit. 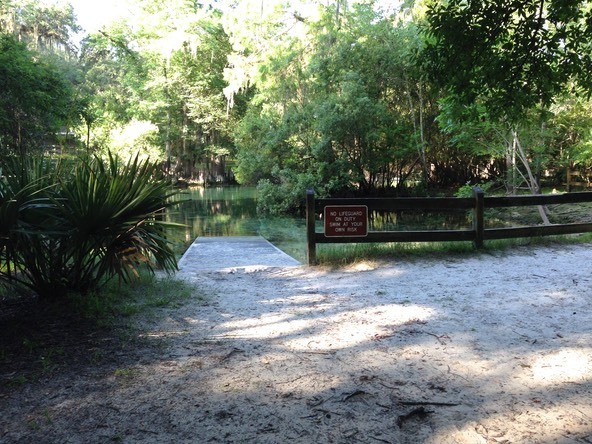 I took my coffee and donut down a path on the far side of the spring, thinking that it might go all the way to the Suwannee and a beach where we might have landed. But the path ended well short of the river at a small picnic area with swimming access into the spring. It was a pretty place, so I sat down at a picnic table and enjoyed my coffee and donut before heading back to my car, the mystery still unsolved. Jill Linguard was the trainer in today’s exercise. Tom Berson and I were to assist her. I wasn’t sure if Jill wanted to use the parks ten foot rec. boats for our training, or use the boats we had brought. So, I gathered the gear together I thought I would use either way, but did not get my boat off the trailer. I sat in the car reading the “local” paper (Gainsville) looking to see if there were common issues shared by the East coast and Central Florida. While I was reading, Jill slipped in. She didn’t see me, and I didn’t see her arrive either. At about 9:50 I got out of the car and spotted her and her car, no boat on the roof. Did this mean that she had left her boat at home and intended to use a park boat for training? Or was her boat already at the launch site? I hurried to the kayak launch and found Jill and her boat there. So I rushed back to get my boat as participants began to arrive and prepare for the training. My real reason to be at this training was to observe a session lead by someone who had some experience with it, as I was tentatively scheduled to lead a similar training near Panama City in June. The session began with a safety talk focusing on fitting PFD’s to the paddler, then fitting the paddler to the boat. Stabilizing the participant’s boat when launching came next. The boats being used by the trainees ran the gamut, from ten foot rec. 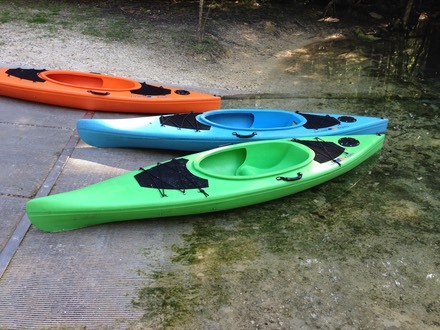 boats with limited flotation, to a variety of sit-on-tops, to sit-inside sea kayaks. All Participants had to demonstrate the ability to paddle forward in a straight line for a significant distance. The trainers offered information on paddle position, torso rotation and the use of foot pegs. Next came sweep strokes, reverse strokes and draw strokes. The “final test” for the group was paddling a figure eight course following Jill while Tom and I acted as markers and observed the participants. All passed! Finally it was time to get wet! Everybody but me, that is. Our second session was on self and assisted rescue training. But I was under doctor’s orders not to submerge my head following a recent eye surgery until I had his OK. So I observed and assisted where I could. Participants were asked to try reentering their boats from the water. Failing that, they were to swim their boats to shore, bail them and relaunch. Both approaches were acceptable. Then they practiced reentering their boats with assistance. These folks had little or no instruction in how to do this, but all were successful in one way or another. The biggest issue in reentering for most people was a lack of deck lines to grab on to. With the formal parts of the assessment over, it was time to explore the spring run, which everyone but Jill did. Jill headed back to shore to complete the paperwork needed to certify the participants as ready to lead short trips in their respective parks. Such is the price of leadership! 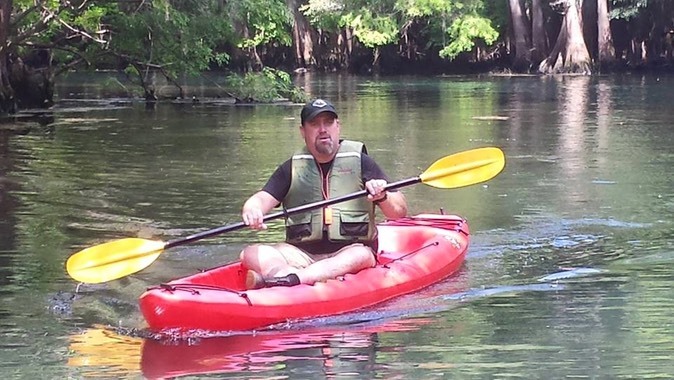 Meanwhile, the rest of us enjoyed our paddle down the spring run and upstream along the eastern Suwannee shore. 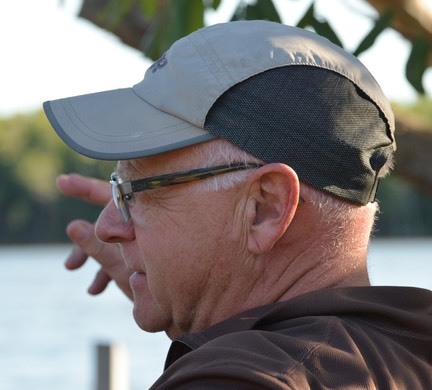 I headed across the river to the western shore and stopped for a moment to record some thoughts on the mystery of my previous visit. Bruce and I paddled to Manatee Springs on a somewhat cold and overcast February day. We must have paddled up the spring run to the kayak launch site where we disembarked to explore a bit and find a restroom. It was at the cordoned off spring head that we saw the wildlife volunteers monitoring the wounded manatee and her calf while they awaited Fish and Wildlife officers who would transport both manatees to a treatment center. It’s the only explanation I have and the only one that makes sense. Following the training, I reloaded my boat and said goodbye to Jill and Tom. Then I headed for the park concession for a cold drink. I contemplated taking a swim in the spring, but that would have meant finding dry clothes and a place to change into them for my drive home. So I didn’t do it. I headed back to the car, jacked up the air conditioning and headed back into Chiefland and the Dunkin Donuts. A sandwich and a medium coffee were all I needed for the trip home. It was one o’clock. I pulled into my driveway just before five.